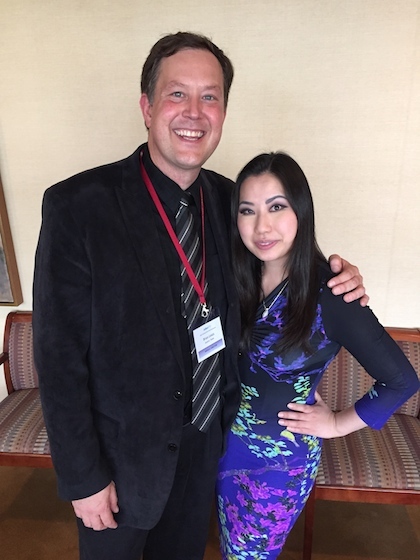 May 26, 2015, 10:41 PM · On Tuesday, superstar violinist Sarah Chang returned to her alma mater, The Juilliard School, to conduct the first master class in the 2015 Starling-DeLay Symposium on Violin Studies and to talk with participants about her own career. She was generous in her support for the young artists who played for her and open about what she has learned from a career that began when she was a tiny child and continues at full throttle today, some 30 years later. The master class began with Angela, 17, who performed the first movement of the Brahms Violin Concerto. She played this piece, with its many technical and musical challenges, with care and control, and the lyrical parts were sweet and singing. Afterwards Sarah applauded her efforts, adding, "I like your shoes, too!" They started by working on the opening, Sarah asking for more shape and drive in certain places, "so it feels like you are going forward and not just playing perfect." They worked on the first iteration of the movement's melodious lyrical passage. Sarah said that Angela's playing already "goes straight to your heart, it's so beautiful." In this piece, though, "it needs to be so pure -- no slides, no glissandos, nothing. Imagine looking at your face in the morning -- no makeup." In working on a passage with many triple-stop chords, Sarah said that Dorothy DeLay once told her that "when you have a chord, the E will ring regardless. So use your bow arm to emphasize the lower notes." For one musical line, Sarah asked her if Angela was aiming for a long line, or for a series of steps, dynamically, adding that either concept was acceptable, but she felt she needed to commit to one or the other. Angela said she was aiming for steps. "If you want steps, you need to have definite steps." Next was Felicity, who played the third movement of Mozart Concerto No. 3. It's a piece that requires a light touch, and Felicity had it, as well as accuracy and good musical humor. This movement has several fast passages that are played twice, first loudly and then with an echo, which is generally played off the string. Felicity was doing this, but Sarah advised that with an orchestra or in a large hall, the difference needed to be clearer. Making the soft part bouncier made this difference more apparent. Next, Valerie played the first movement of the Tchaikovsky Concerto. "Now that's ballsy playing!" Sarah Chang said. (Wouldn't it be cool to have Sarah Chang say something like that about your playing?) Then, "There's really not much to say, but since we're here..."
One thing they discussed was a certain passage, before the first big tutti, which is marked "Poco più lento." There's been a bit of a movement lately to play that passage on the slower side (you can read Hilary Hahn's comments on the matter, for example.) Sarah, who also has played the Tchaik literally thousands of times, finds this not to be Tchaikovsky's best writing. (It's not exactly Swan Lake). She advised not to slow down much there, rather "lighten up a little and coast over that section" and focus more energy on emphasizing the fortissimo high trills that follow it. We also got to hear the last movement of the Tchaikovsky, played by Emily, 16, whose set-up is so picture-perfect that I include this photo at right to show my students (and everyone else's). She played with excellent concentration, musicality and intonation; and Sarah just wanted more drive from her. "It almost seems like you are being so polite to your instrument because you don't want to hurt it," Sarah said. "Don't be afraid to dig in and give it some guts!" It occurred to me that permission from Sarah Chang is likely a powerful thing! She also advised her to put more shape into the thicket of notes that appears as an exchange with the piano (at letter L) toward the end of the piece. It's a fast passage with double-stops and string crossings. Sarah asked Emily to watch the pianist, Pamela Viktoria Pyle, who was clearly increasing the volume and energy with each statement. "Watch her hands," Sarah said. "Every time she plays that, it gets more and more, until the point where her whole body is involved and her hair is flying...It's all about drive, and making this huge accelerando at the end." And speaking of the end -- five measures of octave D's repeated in 16th notes -- "there's no reason to play pianissimo there," Sarah said. "They're never going to hear you unless you're blasting the heck out of that!" After the master class, Symposium Artistic Director Brian Lewis interviewed Sarah, who also took questions from the audience. Both Brian and Sarah had been students of Dorothy DeLay, the extraordinary Juilliard teacher who also was the founder of this symposium. Brian had been a student when Sarah was very young, and he had even sat in on many of Sarah's lessons with DeLay. Here are some of the highlights of that interview from Tuesday. First Brian asked Sarah: How did you start playing the violin? At three, Sarah started piano lessons "It wasn't my choice, not to!" Her first violin lessons began at age four and a half, with a 1/16-size violin -- "a toy -- it's like one of those Christmas ornaments!" Her first teacher was her dad, also a violinist. The family soon realized that "it's a colossally bad idea to study with a parent," Sarah said. Her father had taken from Dorothy DeLay, so in order to find peace in the family, they Sarah would audition for DeLay. So at age 5 1/2, she auditioned at Juilliard, playing the Bruch Concerto and Mozart Concerto No. 3, and "they let me in, for some reason," she said. From then on, Dorothy DeLay "was everything. Our teacher, a third grandmother..."
What was the most important advice Dorothy DeLay gave her? "To date outside of the business," Sarah said, making everyone laugh. "I was older when she said that." Sarah described DeLay as being gentle and yet demanding and persistent. "She would never tell you what to do. She would say, 'Sweetie, could you push that D up a little?' and you thought, 'Sure, I can push that D up a little!' Then you would get home and realize, oh, she was saying I was playing out of tune!" Brian asked if there were any pieces that she hasn't played, that she'd like to play. Sarah said she tries to schedule one piece every season that is new to her; recently it was the Barber Concerto; next season it will be Astor Piazzolla's "The Four Seasons of Buenos Aires." She also said she'd like to commission more new pieces. Brian asked her if she had any helpful advice for teachers of prodigies. Sarah said that when she was young, "there was a moment when I was so overwhelmed. I was upset every time I had a concert and had to miss a slumber party." She was also having to deal with managers, publicists, record companies and all kinds of stress at a young age. At this point, DeLay took her aside and told her to "surround yourself with really good people who can take care of 'the noise' so you can concentrate on what's important: the music." "I loved that she took a moment and explained that to me," Sarah said. DeLay then helped her assemble a team of people. Has she ever needed a break? That moment came when she was 17. "I'd been going so strong for 10 years," she said. "I wasn't tired of being on stage, but I was tired of traveling. It sounds really glamorous and cool, but you end up flying more than flight attendants and pilots." So they scheduled a break for her. "I finished what we had contracted, and planned a good solid two months off," she said. During that time, "I did nothing, I ate, I went to the movies. But after about a week or so, I started to miss the violin. So that allowed me to start missing it and wanting to go back to it." How does she feel about competitions? "To be honest, I am not a product of competitions. I never entered one, never won one, never lost one. I did not go through that whole process. But I had so many friends who did," she said. "How do you judge a musician? It's not a tennis game; it's all interpretive. In a general way I'm not a huge fan, but I do realize the benefits of participating in one, especially if it comes with a cluster of concerts, that might give that artist the start they need. Or a recording contract, or other benefits might come with it." Brian Lewis added that DeLay thought that competitions were a necessary evil. "Did you know that David Oistrakh won second in a competition? That shows you right there," she said. "Cindy Crawford won second place in a beauty contest. Do any of us know who got first place? " Brian Lewis asked her how much she practiced, when she was seven. "Probably about one or two hours, maybe three if I had a concert," she said. "I had school until 4 p.m., and I had to have my mandatory one hour of television after school - that was non-negotiable! Saved by the Bell. And then I would do about 45 minutes of the basics: etudes, scales, arpeggios, chromatic scales, thirds, sixths, octaves -- all the drill Ms. DeLay gave her students." "I found that focused practicing is more effective than long, drawn-out hours of practicing," she said. "I think one of the reasons I haven't had major problems with my hands or arms or neck is the fact that I don't practice more than an hour. I'll do an hour, then I'll put the violin down and do something else, and then go back for another hour. But I always give myself a break, just because violin is such an awkward instrument -- everything is asymmetrical." Sarah also talked about the audiences for classical music. "I think that audiences for classical music are really smart, they're sophisticated," she said. They aren't fooled by hype. "I think we have the most loyal fan base out of any musical style. I have had people come up to me after concerts and say, 'I saw you play at Aspen when you were six years old.' These fans are the most loyal anywhere." And how many times has she played the Tchaikovsky Concerto? "Probably in the thousands," she said, with all those repeated subscription concerts. An audience member asked about her bows. "I collect bows," she said. "With a different bow, you get a completely different sound." Sometimes, she will change bows between pieces. "There are times when I'd use a different bow for Brahms than I would use for Mozart. I travel with four because you can fit four in your violin case." She uses different ones for heavy concertos played with orchestra than with a lighter concert played with a small group or recital situation. Different climates call for different tensions, for example, Aspen vs. New York. "It's really where you are, that determines the tension." Even being in a warm room with stage lights requires different tension than a practice room. She said she rehairs her bows "ALL the time. It's ridiculous how often I rehair my bows. Every two weeks." That means she often has to have it done while traveling, and though she has people she regularly goes to in certain cities, she occasionally has to go to one she knows only by reputation. How often does she change strings? "I used to use Dominants and changed them twice a month. I have new strings now, from Thomastik. They are trial strings, they custom-made for me and are not on the market, but they last a little longer, I change them maybe once a month," she said. "But it depends on how hard you are playing, and what you are playing. If you're playing Mozart, you can go for at least a month. If you're playing Shostakovich, two days, that's it!" Asked about her most memorable performance, Sarah described a performance in Berlin. She'd been accustomed to American audiences, who clap between movements, show great enthusiasm and give frequent standing ovations. But in Berlin, there was complete silence between movements, and no standing ovations. "You're wearing a little pink dress your mom made you wear and these matching pink horrible shoes, and you walk on stage and if you're that small, people clap. I was so used to that." But in Berlin, no one stood up. Yet after the performance, people applauded and applauded, "until I had 12 curtain calls. Then the orchestra left!" she said. "The audience gave me another curtain call. There is a photo -- all these empty chairs because the orchestra had left, and me, this tiny little figure on stage alone, taking a curtain call. It was a different sort of audience reaction, and was equally as moving." Sarah Chang had dinner with all the student artists chosen to perform this week at the Starling-DeLay Symposium, then took them for ice cream! Here she is with them and with Symposium Artistic Director Brian Lewis. May 27, 2015 at 01:45 PM · Thank you for this post! Very interesting and makes us feel like we were there too! Have a great time in NY! May 31, 2015 at 06:49 PM · A great summary of the master class and nice anecdotes about Sarah's life. I hope the master class will eventually make its way to youtube.